...Because He Had Very Little Reason To! The motivational story of how "Abraham Lincoln Didn't Quit," is the greatest crock of BS and collection of untruths that are circulating around the Internet today; and it serves as a rank bastardization of American history. The fact that this story has continued to be published in countless magazines and newspaper columns for the past four (4) decades; including an appearance in a 1967 issue of the Reader's Digest; stands as a testament to the propaganda machine that is the United States Media, which continues to be anything but FREE and/or UNBIASED. "Abraham Lincoln Didn't Quit" is today a little favorite feature of almost everyone's inspirational e-mail list, web sites; and likely more than a 1,000 various "self-help" books. It so completely exemplifies what is so wrong about trying to turn yesterday's American history, into tomorrow’s motivational speech. Our past is something that we should all learn from, but we would be wise to remember that our American past is just that... Our Past. It was a much different time, a significantly different culture, with completely different set of beliefs; and the solutions that were found for our past problems may not necessarily apply to the problems of the present day; or even in the future. In today’s Internet age, history is created from scores of global events that have occurred no more than just one minute earlier. Abraham Lincoln is the mythical embodiment, and the towering figure that best visually represents our American history. Regardless of whatever you may feel about President Lincoln’s accomplishments, he was indeed both a fascinating and exceptionally intelligent man. He is a true testament to the ethos that "Anyone Can Make It in America." A man of modest means, with little formal education; born in a small one-room log cabin in the backwoods of rural Kentucky. Lincoln is perhaps most remembered as "Honest Abe," a honest and hard-working man who in fact overcame almost every obstacle that life ever threw his way; eventually moving from that one (1) room log cabin to the one hundred and thirty two (132) room White House at 1600 Pennsylvania Avenue in Washington D.C., where he served America during the years of her deepest and darkest internal crisis. There are three men whose words have always reduced to me to very quiet fits of emotion, each one had chosen to dedicate their life to the vision of a greater tomorrow. Two of them were the Americans: Dr. Martin Luther King Jr., and the 16th President of the United States of America - Abraham Lincoln; and the other was the Nobel Prize winning Irish poet and writer George Bernard Shaw. Men who dared and chose to speak out loudly, about the need for a more peaceful and tolerate world. A man who so vividly share his dream of a more peaceful world, in his speech titled "I Have a Dream." Just stop and think about how his dream, and through those words, he continues to impact the basic human rights of all human beings… throughout this entire world. Think about how Shaw’s words, even today continue to inspire the masses, whenever they are heard: "Some men see things as they are and say, Why?' I dream things of that never were and I say, Why not?" Abraham Lincoln’s almost spooky ability to see into the future of America, a country that he loved so, has always captivated and fascinated me so. "Wise statesmen as they were, they knew the tendency of prosperity to breed tyrants, and so they established these great self-evident truths, that when in the distant future some man, some faction, some interest, should set up the doctrine that none but rich men, or none but white men, were entitled to life, liberty and the pursuit of happiness, their posterity might look up again to the Declaration of Independence and take courage to renew the battle which their fathers began...." Lincoln stated during his 1858 debate with Stephen A. Douglas. Although "Abraham Lincoln Didn't Quit" appears to present the former United States President as a man who "never gave up", it gross untruths can lead one to believe that it is in fact meant to subconsciously supplant the message that "Honest Abe" (as he is frequently referred to) was in fact a miserable failure; and whose failures caused him to suffered from great self doubt. That Lincoln’s fragile mental state drove him into a nervous breakdown; and that United States President Abraham Lincoln was in fact poor, uneducated, incapable of making a decision which he would not second guess later, and that he was very likely extremely mentally unfit. Leading the reader to also believe that the President Abraham Lincoln was for those reasons a very poor choice for the Presidency of the United States of America. So I now feel compelled to set the story about President Abraham Lincoln straight, who I believe to be America’s greatest President, serving his country in the darkest days of its civil unrest. A man who certainly saw more than his fair share of hardship and setbacks, but who also achieved remarkably successful in many different endeavors; and who is certainly deserving of better than this Internet garbage. 1816: Lincoln’s family was in fact forced out of their home, and Abraham did have to go to work to help support them. Life on the American frontier during the early 19th century was by far no picnic for anyone; it required hours of back-breaking work every day…from everyone who was physically capable of working. In the context of their time, however, the Lincolns in fact lived under some rather unremarkable circumstances. To say that the Lincolns were "forced out of their home" in 1816 is rather a bit misleading, because it implies they were suddenly and involuntarily uprooted and thrown out of their own home, with any kind of warning and with no place to go. * One - Kentucky was a slave state, and Thomas Lincoln despised slavery -- both because his church was opposed it, and because he did not want to have to compete economically against free slave labor. * Two - Kentucky had never been properly surveyed, and many settlers in the early 1800s often found it difficult to establish clear title to their land. Thomas Lincoln, and other farmers in the area, eventually got sued by non-Kentucky residents who held prior claim titles to their land. Therefore with plenty of land available in neighboring Indiana, a territory where slavery had been excluded by the Northwest Ordinance, and where the state’s government guaranteed buyers a clear title to their property, Thomas Lincoln opted to move rather than spending the time and money fighting over the title to his Kentucky farm. So, I guess in a sense it could be said that the Lincolns had been "forced out of their home," but it did not happen quiet so abruptly, and in the end they opted to leave; because there were better opportunities awaited them in Indiana. The other part of this statement, that a seven-year-old Abraham Lincoln "had to work to support" his family, is even more grossly misleading. As young Abraham did not have to take any outside jobs to fend off his poor family financial ruin. Like nearly all American farm children of his era, Lincoln was expected to perform whatever chores and tasks that he was physically capable of handling around his family’s farm. If Abraham worked harder and/or longer than other children, it was not because the Lincolns' financial circumstances were extraordinarily difficult, but because Lincoln was exceptionally tall and very strong for his young age. This, at least, is no amazing embellishment. Lincoln's mother Nancy did in fact die of brucellosis (known as the "milk sickness") in 1818, when Abraham was then only nine years old. A mother's death is always a tragedy for any child, and it was an especially difficult hardship for any struggling farm family. Stating that Lincoln "failed in business" is yet another misleading claim, because it implies that Abraham was the owner or perhaps the operator of the failed business, or that he was otherwise responsible for the failure of the business. None of this is true. Lincoln left his father's home in 1831, and along with his cousin John Hanks, they took a flatboat full of provisions down the Mississippi River from Illinois to New Orleans for a "none too scrupulous businessman" by the named of Denton Offutt. Offutt planned to open a general store, and he had promised to make the very intelligent young Lincoln his manager after he returned from New Orleans. Lincoln operated the store as Offutt's clerk and personal assistant for several months (and by all accounts he did a fine job of it) until Offutt, a struggling businessman, overextended himself financially and ran his business it into the ground. Thus by the spring of 1832 Lincoln had indeed "lost his job, but not because his own failure in business." 1832: Ran for the state legislature and lost. Lincoln did run for the Illinois state legislature (where he was then living) in 1832, although as Lincoln biographer David Herbert Donald noted, "the post he was seeking was not an elevated one . . . [legislators] then dealt mostly with such issues as; whether cattle had to be fenced in or be allowed to enjoy free range." Lincoln finished eighth (8th) in a field of thirteen (13) (with the top four vote-getters becoming legislators). However, this same year Lincoln also achieved something of which he was very proud of, when the members of a volunteer militia company that he had joined selected him as their captain. Lincoln would say many years later, that this was "a success which gave me more pleasure than any I have had since." He would also note later in his career, that his defeat in the 1832 legislative election was the only time that he "was ever beaten on a direct vote of the people." 1832: Also lost his job - wanted to go to law school, but couldn’t get in. As noted above, Lincoln actually "lost his job" in 1831. The notion that in 1832 Lincoln "wanted to go to law school, but could not get in" (why he couldn't get in still remains unspecified) is just silly. Lincoln did eventually become a lawyer, and he accomplished the feat in the same manner typical of his time and place: not by attending law school, but by reading law books and observing a great number of court sessions. He was indeed interested in becoming a lawyer as early as 1832, but as Donald wrote, "upon reflection he concluded that he needed a better education to succeed." Lincoln and William F. Berry, a corporal from Lincoln's militia company, purchased a general store in New Salem, Illinois in 1833. (Lincoln had no money for his half of the business; however he didn't technically "borrow the money from a friend" but instead signed a note with one of the previous owners for his share.) Lincoln and Berry were competing against a larger, and a better organized store in the same town; their outfit did very little business, and within a short time it had simply "winked out." The debt on the store became due the following year, and since Lincoln was unable to pay off his note, his possessions were seized by the local sheriff. Moreover, when Lincoln's former partner died with no assets soon afterwards, Lincoln insisted upon assuming his partner's half of the debt as well, even though he was not at all legally obligated to do so. Exactly how long it took Lincoln to pay off this debt (which he jokingly referred to as his "national debt") in its entirety is somewhat unknown. It did with out a doubt take him several years, but not seventeen; nor, as this statement implies, was he completely financially encumbered until it was paid in full. Within a few months of the store's failure, Lincoln had obtained a position as the New Salem postmaster, and by 1835 he was earning money both as a surveyor and as a state legislator. 1834: Ran for state legislature again - won. In 1834 Lincoln was again one of thirteen candidates running for a seat in the state legislature, and this time he won, securing the second-highest number of votes among the field. Little is known about Lincoln's relationship with Ann Rutledge, including whether or not they were in fact actually engaged. (At the time that they met, Ann was already betrothed to another man.) Nonetheless, her death in the summer of 1835 was a terrible blow to Lincoln, sending him into a profound depression. Whether Lincoln experienced a "nervous breakdown" in the aftermath of Ann Rutledge's death is certainly debatable, but how he would have found time to stay "in bed for six months" is a complete mystery. After Ann's funeral he spent a few weeks visiting an old friend, and within a month of her death, records show that Lincoln had resumed his occasional surveying duties. He surveyed the nearby town of Petersburg, Illinois in February 1836, and then undertook a strenuous two-month campaign for his re-election during that summer; serving in the state legislature throughout the end of the year. All of this would have been very difficult for a man who bedridden from depression for "six months in bed." 1838: Sought to become speaker of the state legislature - defeated. * Lincoln was re-elected to the state legislature in both 1836 and 1838, each time receiving more votes than any other candidate running. * That the Illinois Supreme Court granted Abraham Lincoln a license to practice law in the year 1837. * That Lincoln became "one of the most prominent and successful lawyers in Springfield," where he was then living. This statement is simply wrong. Lincoln was named as a presidential elector at the State of Illinois Whig Party Convention on 8 October 1839, and he campaigned as a Whig elector during the 1840, 1844, 1852, and 1856 presidential elections (skipping the 1848 campaign, because he was serving in the United States Congress). One could claim this as a Lincoln failure in that he wanted to be a Congressman, and he did fail to achieve that goal, but it is technically inaccurate to claim that he "ran for Congress" in 1843 and lost: The election was held in 1844, and Lincoln was not a candidate in this election. Lincoln's failure to achieve his party's nomination at the May 1843 Whig District Convention is undoubtedly what is referred to here. 1846: Ran for Congress again - this time he won - went to Washington and did a good job. Lincoln won a seat as an Illinois Representative to the U.S. Congress in 1846. 1848: Ran for re-election to Congress - lost. Lincoln did not "lose" the 1848 election. He didn't run for re-election to the U.S. Congress. This can not be claimed as a failure, simply by assuming that he had declined to run because he felt that he would lose. He didn't run because the Whig policy at that time in America specified that all party members should step aside after serving one term, to allow other members to take their turns at holding office. Lincoln having already been urged to serve two terms, who was a very faithful party member, chose to comply with his party’s rules. 1849: Sought the job of land officer in his home state - rejected. The position referred to here was that of the commissioner of the General Land Office, which was a federally appointed position and not a state one; and one that came with a fair amount of power and patronage. Since Lincoln's term in the US Congress was about to expire, his friends had urged him to apply for this post, but Lincoln was very reluctant to give up his very successful law career. However, he finally agreed to apply for the job; but only when the choice was then deadlocked between two other Illinois candidates and it looked as if the appointment might be given to someone from outside the State of Illinois. Whigs from northern Illinois then decided that too many appointments were going to party members from other parts of the state, and hence they put up their own candidates against Lincoln. The choice was then left up to the Secretary of the Interior, who then selected the other candidate…..who was the Secretary’s own cousin. It should be noted that in Lincoln's time, candidates for U.S. Senate seats in Illinois were not directly elected by popular vote. Voters cast ballots only for state legislators, and the General Assembly of the state legislature then selected nominees to fill open Senate seats. So, in 1854 (and again in 1856) Abraham Lincoln was not technically running for the United States Senate; he was actually campaigning on behalf of Whig Party candidates for state legislature seats; all throughout Illinois. Nonetheless, after the 1854 state election, Lincoln made it known that he would like to fill the open U.S. Senate seat for the State of Illinois. The first ballot of a divided General Assembly was taken in February 1855, and Lincoln received the most votes… but he was six votes shy of the required majority. When the process remained deadlocked after another eight ballots, Abraham Lincoln withdrew his name from the race to lend his support to another candidate; ensuring that the US Senate seat would not be filled by a pro-slavery Democrat. 1856: Sought the Vice-Presidential nomination at his party’s national convention - got less than 100 votes. This is both misleading and inaccurate. Lincoln did not "seek" the vice-presidential nomination at the 1856 Republican national convention in Philadelphia; his name was put into nomination by the members of the Illinois State Delegation and after most national delegates were already committed to other candidates. Lincoln himself was in fact in Illinois, not at the convention, and did not even know that he had been nominated until friends brought him the news. Nonetheless, in an informal ballot, Lincoln received just 110 votes out of 363, not at all a bad showing for someone who was little known outside his home state and not even in attendance at the convention. 1858: Ran for U.S. Senate again - again he lost. Again, Lincoln was not directly campaigning for a Senate seat, although it was a foregone conclusion that he would be the Republicans' choice to take Stephen Douglas' U.S. Senate seat if his party won control of the Illinois state legislature. Lincoln actually bested Douglas in that Republican candidates received slightly over 50% of the popular vote, but the Republicans failed to gain control of the legislature, and so Douglas retained his seat in the Senate. 1860: Elected president of the United States. 1864: Abraham Lincoln was reelected for a second term as president of the United States. 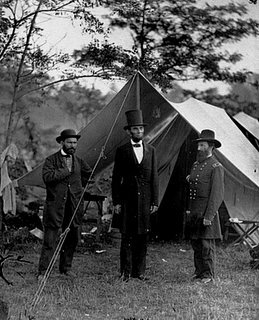 Abraham Lincoln’s administration was hampered by the incompetence, but that incompetence was never his own; rather it was that of Lincoln's many Union generals, the inexperience of their troops, and the harassing political tactics both of the Republican Radicals, who favored a harder policy toward the South… and the Democratic Copperheads, who desired a negotiated peace. Lincoln’s Gettysburg Address on November 19, 1863, I believe marks the highest point in the record of American political eloquence. Abraham's long search for a winning combination finally brought generals Ulysses S. Grant and William T. Sherman to the top; and their series of battle victories in 1864 dispelled the mutterings from both the Radicals and Peace Democrats, that had at one time seemed to threaten Lincoln's reelection. "With malice toward none, with charity for all . . . let us strive on to finish the work we are in; to bind up the nation's wounds . . ."
This policy aroused growing opposition among the part of the Republican Radicals, but before the matter could be put to the test, Lincoln was shot by the actor John Wilkes Booth at Ford's Theater, Washington, on April 14, 1865. He died that next morning. In the opening paragraph I stated that I felt that "Abraham Lincoln Didn't Quit," stands as a rank bastardization of our own American history, and that it is an obvious product of our US Media propaganda machine; because as you can clearly see from what you just read above... Abraham Lincoln’s life was certain powerful enough to be extremely motivating to others. So ask yourself now, why all of the blatant lies and untruths? Why with all the information about Abraham Lincoln's life out there and freely available, are there still so many lies about Lincoln being circulated today?? I believe that these lies continue circulating for the very same reason that James Madison is known today as Father of the United States Constitution, despite the fact that it was Roger Sherman who drafted the Great Comprise that is credited with saving both the Continental Congress and the United States Constitution (a comprise that is today our two house system of government.) It is also the very same reason, that despite the fact that Roger Sherman was only American to place his signature upon all four of the United States founding documents, (the Declaration of 1774; the Declaration of Independence 1776; the Articles of Confederation 1781, and the Federal Constitution of 1788), he still remains virtually unknown to most Americans. Roger Sherman and President Lincoln only real shortcomings were their lack of wealth and social ranking (breeding); thus they are not afforded their proper place in our American history books or even in today's US media. "Roger Sherman is a solid, sensible man." "That is Mr. Sherman of Connecticut, a man who never said a foolish thing in his life." Judge David Davis (1815-1886), who was a noted lawyer and judge, politician, and Supreme Court justice. He had been active in both Illinois state and national Republican politics, Davis was elected in 1844 to the state legislature. In 1848 he was elected judge of the Eighth Judicial Circuit, a position that placed him in regular contact with lawyer Abraham Lincoln. The two developed a close friendship while serving the fourteen-county circuit. When President Abraham Lincoln was assassinated, even though Justice Davis was then sick in bed, he went to Washington, D.C. and took care of all of Lincoln's affairs. Davis rode on the funeral train that carried Lincoln's body back to Springfield, Illinois. Justice Davis later disassociated himself completely from the Republican Party, after the Civil War, in silent protest of the often alleged Republican Radicals who assassinated his best friend. In 1872, Davis was nominated by the Labor Reform Party as a candidate for the United States presidency. Five years later he was elected to the United States Senate, a position which he held until he retired, in 1883, back to Bloomington, Illinois. Justice Davis died there three years later. Justice David Davis was the maternal first cousin of David Davis Walker, Sr., who moved from Pekin to Bloomington, Illinois before he moved to St. Louis, Missouri. David Davis Walker was also the father of George Herbert Walker, the Grandfather of Dorothy Wear Walker, the Great-Grandfather of former United States President George Herbert Walker Bush and the Great-Great Grandfather of the current United States President George Walker Bush. It would be interesting if one could know just what Uncle Justice David Davis would think of his Republican Presidential ancestors and how they have served this great country.